Veronica Phillips, now 92 years old, was just a teenager when the Nazis sent her to a concentration camp. She and her family were among millions of Jews targeted in the Nazi-led Holocaust during World War II. The war ended when she was 19; she moved to South Africa in 1956 to be with her brother. For decades, she refused to speak of her experience. But the effects of abuse, hard labor and a brutal death march before the war's end have haunted her for most of her life. "I had eight miscarriages because they gave us bromide and it killed my reproductive organs," she told VOA as she prepared to tell her story to a crowd in Johannesburg this week. "I couldn't have any children." 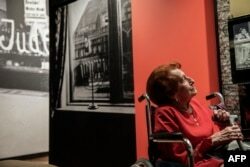 Holocaust survivor Veronica Phillips looks at her family portraits and memorabilia during the official opening of the Johannesburg Holocaust & Genocide Center and its permanent exhibition in Johannesburg, March 14, 2019. Numerous stories like hers fill the hallways of the Johannesburg Holocaust and Genocide Center, which opens to the public this month. While South Africa may seem very far away from atrocities like this, the nation boasts Africa's largest Jewish community, with some 70,000 Jewish residents, according to census figures. 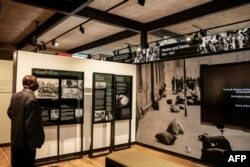 But it's South Africa's own painful history of colonialism, apartheid and violence, which is documented at Johannesburg's Apartheid Museum, that makes this new center so important, says its director, Tali Nates. These seemingly faraway, foreign events echo South Africa's own history of alienation. Hatred and acts of inhumanity could make it easier for South Africans to make sense of their own difficult stories. "We find that talking about other case studies, other crimes against humanity or genocide or other atrocities will allow us to speak about our own history," Nates said. The center also focuses on Rwanda's 1994 genocide. This year marks the 25th anniversary of those 100 horrific days that saw the slaughter of 800,000 Tutsis and moderate Hutus. 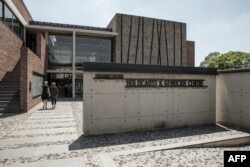 People walk toward the front entrance of the Johannesburg Holocaust & Genocide Center for its permanent exhibition inauguration in Johannesburg, March 14, 2019. Sylvestre Sendacyeye was 14 when he hid in a Kigali church and watched the murder of his parents and three siblings. He says he still suffers from regular nightmares and struggles to tell his whole story to his oldest son, who is now 15. But, he says, he's forcing himself to share his experiences with visitors to the center. In recent years, South Africa has been hit by periodic bursts of anti-foreigner violence, mainly targeting African residents. Sendacyeye, who has lived in South Africa since 2000, says he feels compelled to tell his story in an attempt to stop the cycle of violence. "I find that the only way you can fight this ideology of racism, this ideology of violence, is they can see what human beings came to do, how come we came to be animals. Not even animals — animals behave better," he said. "I think that's the only way people can avoid it happening, not only in Rwanda." Nates says the center will feature temporary exhibitions on other genocidal acts, such as the ethnic cleansing in Bosnia in the 1990s, the war in Sudan's Darfur region and more. A visitor stands by the permanent exhibition during the official opening of the Johannesburg Holocaust & Genocide Center in Johannesburg, March 14, 2019. These stories are complex and difficult. But Nates says it's often the tiny, personal items, like a much-loved baby doll, that best convey the toll these events took on ordinary people. "This is the most treasured item for me in this exhibition," she said, pointing at the small plastic doll, which is in remarkably good condition for its age. "Childhood dreams, hopes shattered by others, but keeping the memory alive, creating a life for herself. She was a geneticist, she was a lecturer at this university here next door. Yet she kept that doll, and trusted me, and this center, to keep this doll for many generations to come." That doll belonged to Phillips, who carried it — and her tragic story — close to her heart for seven decades.